My major knitting since mid-July has been to work up nearly 3300 yards (15 skeins) of Rowan Pure Wool Superwash Worsted into a throw. Well, a blanket really. I’ve knit nine of these guys. Yep. Nine. Rambling Rows Afghan by Cottage Creations’ Carol A. Anderson is my all-time favorite afghan pattern. This Rambling Rows will live in a TV-watching/office room decked out in earth tones. I think the grays, gold and orange worked out great and the blanket really pops resting on the back of the sofa. Did I come up with these colors, Charcoal, Granite, Moonstone, Seville and Gold on my own? No. Never in a million years. I first bought the yarn intending to knit Star-Eyed Julep Throw by Kay Gardiner, Ann Shayne, and Kirsten Kapur. Here’s that throw. It uses these same five Rowen Pure Wool Superwash colorways. I asked to be gifted the book containing this throw, Drop Dead Easy Knits, specifically so I could knit Star-Eyed Julep. I even worked through the errata supplied on Ravelry and started knitting the first quadrant of the throw. I was not satisfied with the not-crisp edge-turns of what’s basically the Mason-Dixon log cabin technique adapted to create that star. Apparently it takes a better knitter than me to master the technique. After starting the Star-Eyed 3 times I decided I might drop dead before I completed the thing. But oh my those colorways are so perfect together. So, I acquired the additional yarn I needed (difficult, since the Seville colorway is discontinued) and my new Rambling Rows was hatched. I couldn’t be more pleased with the project. And I credit the Drop Dead Easy Knits trio with my success because this Rambling Rows is all about their inspired colorway choices. P.S. Even though I picked up the garter stitch mitered edge the way I always do on my Rambling Rows, this more lightweight yarn picked up a little ruffle. I’ve steamed it a bit since these photos were taken and it’s tamed. 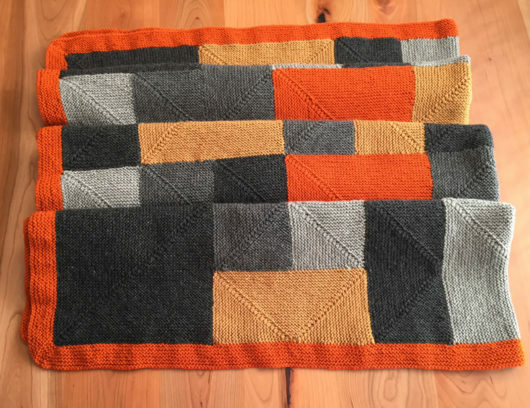 Here’s the rest of my Rambling Rows, if you’d like to see how this blanket works up in different colorways: here, here, here’s four, and another here. I know, that’s not nine. You’ll just have to take my word on that. 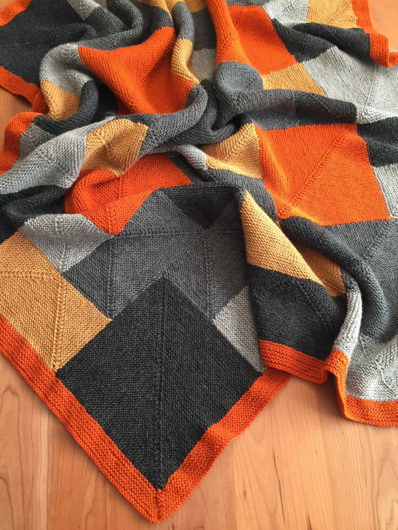 This entry was posted in Knitting and tagged Carol A. Anderson, Rambling Rows, Star-Eyed Julep Throw by Noreen. Bookmark the permalink. This color combo is great! I’ve queued the pattern. Good project to use lots of my stash yarn. How cumbersome does this project become the larger is gets? 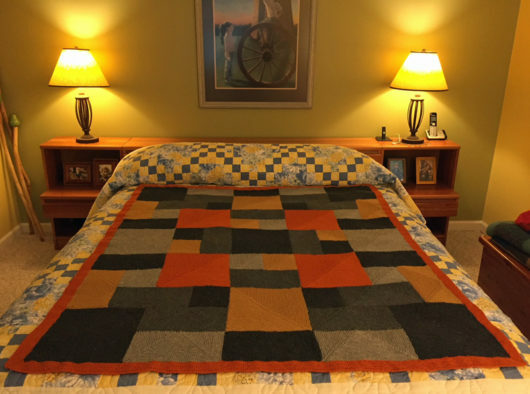 @Amy…the blanket can get a bit unwieldy toward the end. But for the body, you are working only in one small section at a time.